WASHINGTON (BRAIN) — The U.S. Trade Representative has approved the inclusion of e-bikes and e-bike motors on the list of $16 billion worth of Chinese products that will be hit with a 25 percent tariff starting Aug. 23. WASHINGTON (BRAIN) — Two members of the U.S. e-bike industry testified Wednesday in opposition to the Trump adminstration's proposed 25 percent tariff on e-bikes from China. BOULDER, Colo. (BRAIN) — PeopleForBikes will conduct a free half-hour webinar on proposed U.S. tariffs on Friday. Retailers, consumers and suppliers have left dozens of comments opposed to the e-bike tariff. Industry representatives will speak in Washington later this week. WASHINGTON (BRAIN) — Monday July 23 was the final day that the U.S. Trade Representative accepted public comments about its proposed 25 percent tariff on e-bikes and other goods. A public hearing is scheduled for this Wednesday and at least two industry representative are expected to speak. Tariffs range from 22 to 84 percent depending on factory. BRUSSELS (BRAIN) — The European Commission has imposed provisional anti-dumping duties on e-bikes from China, with tariffs ranging from 21.8 to 83.6 percent, depending on which factory produced the bikes. 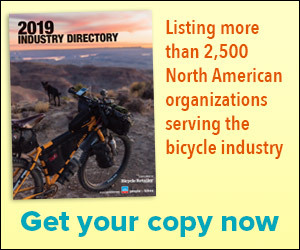 The latest round targets hundreds of imports and includes many bicycle products and components. WASHINGTON, D.C. (BRAIN) — On Tuesday, the Trump administration announced that it would assess an additional 10 percent tariff on up to $200 billion of Chinese goods. GRAND JUNCTION, Colo. (BRAIN) — Two companies that make stainless steel spokes in the U.S. are having to adjust to a 25 percent tariff on imported steel. Both brands said so far they've been able to avoid price increases. TAIPEI, Taiwan (BRAIN) — Taiwanese e-bike exports were up 34 percent in units and 55 percent in dollars through April, as the country's bicycle industry rapidly gears up to supply e-bikes to the world. Chinese-made bearings of many varieties will be hit with a 25 percent tariff starting July 6, increasing pressure on component makers to raise prices. LOUISVILLE, Colo. (BRAIN) — When you buy 5,000 pounds of aluminum every day, you notice quickly when the cost per pound goes up 20 percent — or more — in a matter of months. Dave Batka, the owner of Wheels Manufacturing, is noticing. The industry is scrambling after the Trump administration includes e-bikes on its list of proposed tariffs. WASHINGTON (BRAIN) — The U.S. bike industry has been drafted into the trade war between China and the U.S.
WASHINGTON (BRAIN) — China-made bicycle GPS units are expected to see a significant price increase in the coming months due to a 25 percent tariff imposed by the Trump adminstration. Given the size of his latest punitive tariffs proposal, consumer goods — and bike-related products — are likely to be included. WASHINGTON (BRAIN) — President Trump proposed late Thursday an additional $100 billion in punitive tariffs against Chinese imports, suggesting the president is looking to penalize approximately $400 billion in Chinese goods. About $505 billion in Chinese goods were imported into the U.S. in 2017. UPDATED that GPS units may be subject to the increased tariff.